Four weeks ago, I wrote about having to decide which of three books to read, Alexandra Fuller’s memoir of a decade ago, Don’t Let’s Go to the Dogs Tonight: An African Childhood, or Ian Rankin’s latest Edinburgh crime novel, The Impossible Dead, which had just arrived in the mail. Plus, a third book was on its way from UK Amazon, Martin Walker’s latest in his Bruno, Chief of Police series, The Crowded Grave. After reading a little further into Fuller’s memoir, I switched to the Rankin book, which I wrote about two weeks ago. The Bruno book then arrived, providing a new dilemma. Worse, I would soon be off to Chicago (on the trip I have written about here and here) and I don’t travel with physical books. What’s the point of owning a Kindle if you carry books with you? And what happens if you finish a book on the plane? That meant I would have to delay reading Fuller and Walker in favor of a book on my Kindle. What to choose? 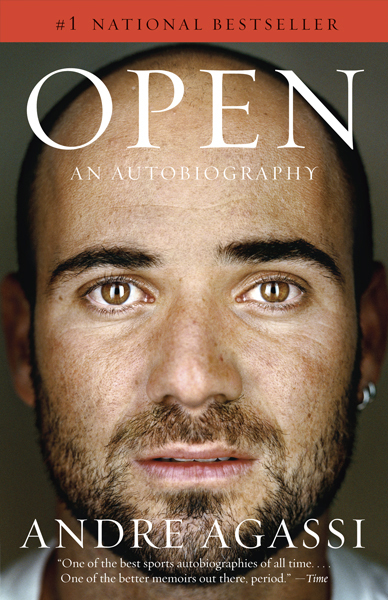 There was that Agassi autobiography I kept putting off, Open: An Autobiography. Maybe its time had come. I had read all about it when it came out two years ago, but wasn’t motivated to read it until my friend Werner urged it on me a short time later. That evening, taking advantage of Amazon’s sample option, I downloaded a short bit from the beginning. Agassi opens his book with what turns out to be a riveting account of his famous 2006 five-set US Open match with Marcos Baghdatis. The sample ended before the match did, forcing me to buy and download the full book just so I could get to the end of the match. Then I put the book aside for another day. With the Chicago trip, another day had come. Following the opening chapter, Agassi gets down to chronological business, starting at age seven. A week and a half ago, I began with the age-seven chapter, to make sure this was a book I would want to take on the trip. To my surprise, I immediately realized that “riveting” wasn’t just a characteristic of Agassi-Baghdatis match, or of the opening chapter. The entire book is riveting. I read Agassi’s description of hitting balls shot at him by the machine his father designed, learned of his father’s background, and knew I was hooked. If I wasn’t careful, I would finish the book before I even got on the plane. Well, I was careful. That didn’t happen. But I spent all my time on both flights reading Open, until finishing it with an hour to go before our Seattle landing. (To be more precise, I spent all my time reading except when we were below 10,000 feet and not allowed to use electronics, which, as anyone who flies with a Kindle knows, is yet another absurd rule forced on passengers by the inane, insane airplane travel gods.) So many great tales. There are the matches themselves, which only get to be a bit tiresome near the end. But best are the relationships. There’s Brooke Shields of course. Their marriage. Her guest appearances on Friends. The divorce. Barbra Streisand and Agassi’s brief interlude with her. Stefanie (her preferred name, as we learn) Graf, the love of his life. The hints, in his mind, that he was meant to be with her. The irony of Brooke Shields putting a photo of Graf on the refrigerator as the model of what she wanted her body to look like as she planned their wedding. And the men in Agassi’s life too, most notably his father, but also the three people who were such an important part of his career: his brother, one of his childhood friends, and his trainer Gil Reyes. Anyone who watched Agassi over the years at the majors would always see Reyes in the stands and hear about their bond. The book explains it. I know, that doesn’t make the book sound so interesting. A big-time tennis pro, his women, and his pals. That’s pretty much it. But really, the book is much richer than that would suggest, and more entertaining too. It’s worth reading just to get to the part where the Agassi and Graf fathers meet for the first time. And it’s an especially good choice for passing the time on two flights.